Kristina 'survived' London's 2005 bombing. But she wasn't OK.
"I survived London's 2005 bombing. But one conversation made me realise I wasn't OK."
Content warning: This post contains mentions of depression, post traumatic stress disorder and suicide that readers may find triggering. If you are in immediate danger, call 000. Two months after surviving the 2005 London bombing that killed 26 people on my train, I had a conversation with my mum that changed my life. I was on a phone call to my mum who was back in Australia. I was home again from work, having another sick day. I couldn’t verbalise what I was feeling, I was just crying all the time and didn’t want to talk to anyone or to leave the flat. I kept telling everyone that I was fine as I believed that I should be — I survived. I wasn’t giving myself the right to feel anything, I didn’t think I had any right. Luckily for me, my mum persisted and said, ‘I do think you need to talk to someone. I don’t care if after talking to someone, they say you are ok, but just go. I’m on the other side of the world and I’m worried’. I felt I wasn’t entitled to get help or take up someone’s time to talk about what I was going through. At the time, I didn’t know that mental illness is just as bad as physical illness. I didn’t know about shock or survivor guilt. I went to the crisis support centre that had been set up for those affected by the bombings. It took all my courage to leave the flat that day and finally walk in. From the moment I opened my mouth to start to talk to a counsellor I realised I needed some help and broke down in tears for over an hour. If my mum had not pushed me, I don’t know where I’d be today. I remember the loneliness, the hopelessness I felt at the time. I truly felt no one understood and that I would be in this dark hole on my own forever. Four months after the event I was finally diagnosed with PTSD. Getting an answer and assigned a psychologist made a huge difference. I felt justified in feeling the way I did and it was a relief to know that I had someone to talk to openly about that day and to start to process it. Around this time, I also met other survivors from the train and a support group was set up. Over the years this group has given me the strength and understanding when I needed it most to keep going. Once I started to process that day and to learn more about mental illness, I needed to do a job that made a difference. Finally, eighteen months ago, I started working for R U OK?. I had already done some fundraising for them back in 2014 while trekking the Kokoda Track so getting the opportunity to work for the organisation and continue to raise awareness made me the happiest I had been in a long time. Too many people suffer in silence and feel unsupported. Having the conversation with my mum that day, knowing someone was there to listen and support me, really did make all the difference. An average of eight people a day in Australia take their own life. 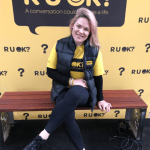 R U OK?’s vision is a world where we&apos;re all connected and are protected from suicide. And our mission is to inspire and empower everyone to meaningfully connect with people around them and support anyone struggling with life. We’ve all got what it takes to look out for one another. For most of us, our eyes, ears and mouths are the resources we can use to support those around us. The R U OK? Conversation Convoy has just travelled 14,000kms around Australia over six weeks equipping people with the four steps to navigating a conversation when someone says, “no, I’m not ok”. Those steps are: Ask, Listen, Encourage action, and Check in. This R U OK? Day, get to know the four steps so you can have a conversation that could change a life. September 14 is R U OK? Day, the day where we reach out to our loved ones and those around us to check in and let them know we&apos;re there. If someone you know is struggling with their mental health, R U OK? encourages you to ask if they&apos;re OK. The R U OK? website has a step-by-step guide to starting this conversation. Mamamia and R U OK? urge anyone struggling with their mental health to seek help from a medical professional or contact Lifeline (13 11 14), Suicide Call Back Service (1300 659 467), Kids Helpline (1800 55 1800) or GriefLine (1300 845 745). FEATURE: Why women are not alright: The hard truth about anxiety. Hannah went to the doctor with insomnia. His ‘solution’ was both insulting and absurd.